Welcome to our web page covering the Bury to Tulle and Angoulême Cycle Tour 2008. 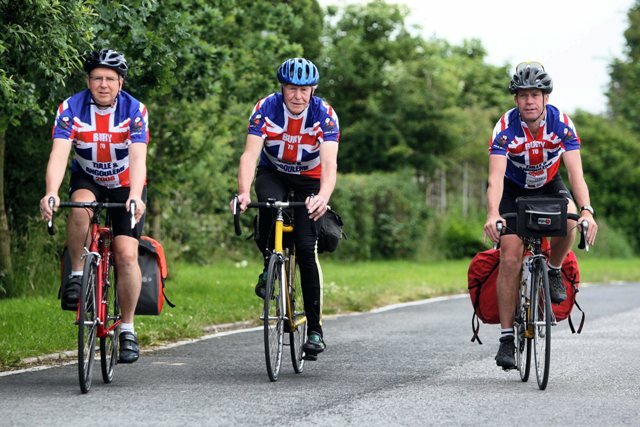 On July 13th 2008, we set out to cycle the 752 miles (1210 km) from Bury in Lancashire to its French twin towns Tulle and Angoulême. We had the support and co-operation of Bury Metro Community Twinning Association (BMCTA). The cycle tour took ten days averaging 75 miles (121 km) a day, in which we rode from Bury across the Pennine hills to Hull; boarded a ferry to Zeebrugge, then rode through Belgium and France. Read our full report below. Some photos can be viewed on the 'Photo Gallery' page. Bienvenue sur notre site. Voici les détails du rallye cycliste Bury-Tulle-Angoulême 2008. TOUR COMPLET. 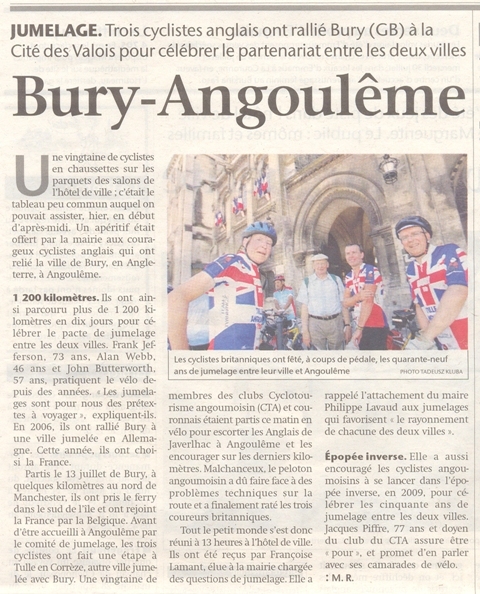 En 13 juillet 2008, un groupe de trois cyclistes de Bury va faire 1210 kilomètres de Bury, Lancashire, Grande Bretagne jusqu’à Tulle et Angoulême, villes jumelée à Bury. Nous avons le soutien du comité de jumelage de Bury. Il est prévu que le rallye dure 10 jours (moyenne journalière parcourue: 121 kilomètres). 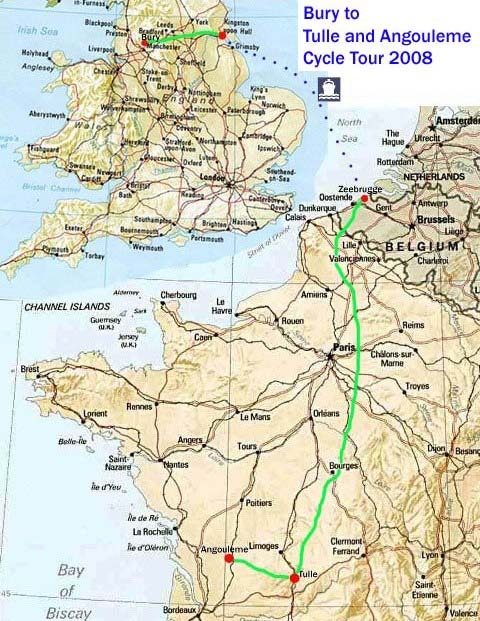 Les participants partiront de Bury, traverseront la Chaine Pennine, prendront un ferry jusque Zeebrüge, puis traverseront la Belgique et la France. Following on from a presentation to Bury Metro Community Twinning Association after the Bury to Schorndorf cycle tour in 2006 we were asked if we would consider doing a ride to Angouleme to help strengthen the link with that town. 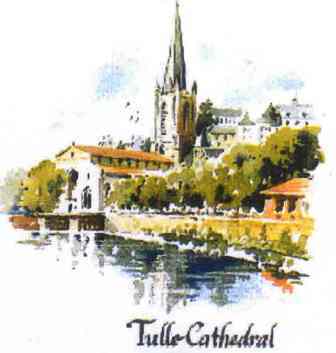 We were interested and seeing that Bury’s other twin town, Tulle, was not too far distant from Angouleme we decided to arrange a tour to visit both towns. Rather than do the tour the following year it was decided to do it in July 2008 to give us more time to plan. Alan Shillaker, the BMCTA member primarily responsible for the link with Tulle, kindly volunteered to be our contact for both towns. He couldn’t be with us on the tour as support car driver but offered to be in Tulle and Angouleme when we arrived and to make arrangements with the appropriate townsfolk and local cycling clubs. We could not get a support car or indeed a driver so the decision was made to ride carrying all our belongings in panniers. 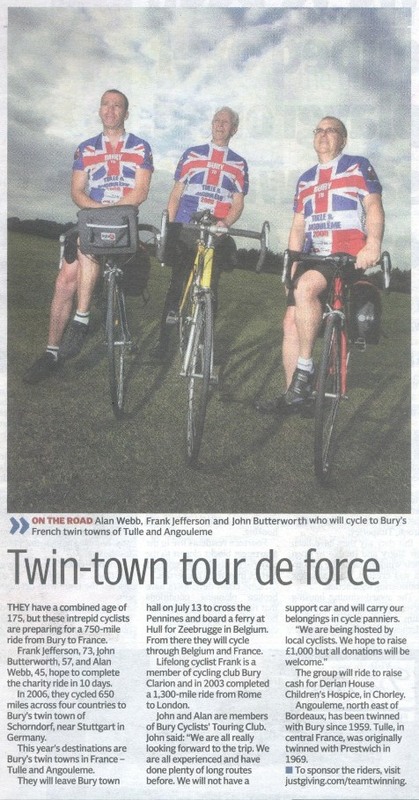 Two of the team who rode to Schorndorf couldn’t make this tour and we could not recruit other volunteers from our cycling clubs or through a Bury Times appeal so that left just the three of us, Alan Webb, Frank Jefferson and myself John Butterworth. 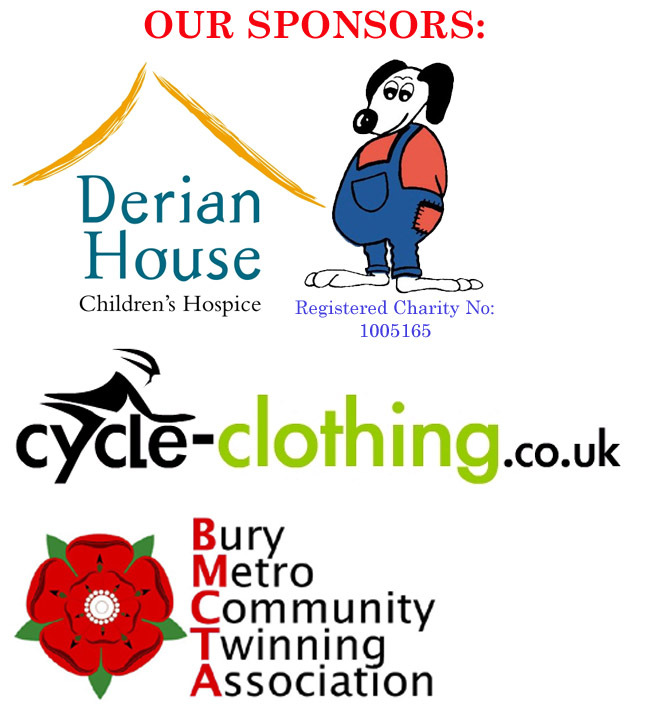 We decided to make the ride a fund raising event and chose Derian House Children’s Hospice as our charity. We would try and get as many sponsors as possible and we would design cycling jerseys for the tour. Cycleclothing.co.uk produced the jerseys at cost and we got some funding from BMCTA towards the cost of the ride. Bury Metro funded the petrol for a support car as far as Hull. In complete contrast to the start of the Schorndorf tour in 2006 the weather was bright with a clear sky when we met at 6am in front of Bury Town Hall. Unsurprisingly there was no one there to wave us off. The Pennine crossing was a joy in the conditions and after climbing out of Huddersfield we arrived at a café in Horbury ready for our breakfast. After a full English we got the waitress to take our photo then we continued on our way through Wakefield, Pontefract and Knottingly making a shop stop at Rawcliffe. The transport café near Goole was closed but the facilities were open, so we ate our sandwiches here to give us sustenance for the ride on the A63. Before hitting the A63 we passed some time trialists, including a tricyclist, warming up for a 10 mile race. We were surprised that this race was to be on the busy A63 dual carriageway as confirmed later by individual cyclists speeding past us on this road. We continued on the A63 with care but at a very good pace until the Humber Bridge was in sight and then we knew it was not far to Hull and the docks beyond. We arrived at the docks early so my wife Janet had not yet arrived in the car with the panniers. Janet, with my daughters Lucy and Anna, arrived in good time soon after and we loaded our bikes for boarding the ferry. We waved farewell and headed to passport control prior to boarding the ‘Pride of York’ ferry. We woke to a clear blue sky. After a hearty breakfast we were first off the ferry as we had tethered our bikes close to the ship doors. We were delighted when allowed to wheel our bikes off before the motor traffic. Then after a pause for Frank to secure his saddlebag we were soon on the Bruges road where we missed our turn to Zuienkerke and nearly joined a motorway. We quickly wheeled our bikes back and turned onto a very quiet country lane which was very pretty but we couldn’t quite get our bearings as villages and road signs were in short supply. Then we had a lucky break. As we halted to look at the map a friendly local cyclist stopped to help and on getting the message through that we were trying to get to Jabbeke he offered to lead us as he was heading there too. With relief we followed him until he led us onto a road which ran alongside the Ostend to Bruges Canal. This was a great ride on a traffic free road with the wide canal to our left. Our leader on his lightweight bike took his leave of us here. We continued along this canal road for some miles and after a while, more by good luck than good management, we crossed a bridge to eventually join the road into Jabbeke. Then it was relatively easy to navigate through Aartrike, Ichtegem and Kortemark and on into Hooglede at one point stopping at a bakers for a baguette and a soft drink. Then the direct road into Ypres via Westrozebeke and Poelkappele before a café stop in front of the famous Cloth Hall. We drew interest from some members of the public who enquired of our tour. We left Ypres by the Lille Gate which Alan photographed then continued on the Nieuwkerke road stopping at a British military cemetery en route. Then it was on to Steenwerke, Le Doulieu, Estaires where we made an effort to find our way to Le Paradis where British soldiers had been massacred during the retreat to Dunkirk in 1940. Alas we couldn’t find it due to a new road development so we continued on into Bethune to search for our hotel. Nearing the town I felt the need for water as the temperature had risen dramatically. On seeing a supermarket sign we diverted off the route only to find it closed. We should have known better – it was the 14th July a national holiday. Spotting a young girl and some boys talking by a car outside a house we stopped and asked for water. She happily went inside to fill the bidons with ice cold water and after thanking her we continued into Bethune. We found the hotel location – Zone Actipolis -easily enough even though on the far side of town but the hotel itself was more difficult to locate. Eventually we found it and made for the shower. Our hotel was the Premier Classe Bethune but the evening meal had to taken in the adjacent Campanile Hotel and the fare was mediocre. I was feeling the effects of the heat – my concerns about not being able to acclimatise to hot weather prior to the tour due to British bad weather being confirmed. The day dawned cloudy with a light drizzle falling. After a very basic breakfast we left the hotel with our rainwear on. I had my bottles filled by the hotel waitress but the water didn’t taste too sweet. We were soon out of Bethune heading towards Noeux les Mines when rain jackets had to be taken off. The weather was warming and the drizzle had stopped. This was the last time we touched our rainwear all tour. We continued on to tackle our first continental climb of the tour out of Hersin Houpigny then on to Aubigny in Artois. We then joined even quieter roads through Hermaville and Wanquentin to Beaumetz le Loges. At Ransart a young Korean cyclist on tour flagged Alan down. He wanted a chat with us as he had been traveling solo around Europe with tent on his loaded bike. I think we made his day. Whilst we were chatting Frank took the opportunity to nip across the road into a garage to get the mechanic to oil his chain for him. We expect the industrial quality thick oil to keep Frank’s chain going for many years to come. Taking leave of our Korean friend we continued up our first single arrow hill and on through Douchy les Ayette where we paused at a small British cemetery. Alan signed the vistor book then we continued through Bucquoy, Puisieux, Miraumont and Grandcourt before riding the road through old battlefields and the site of the hard fought battle for the Schwaben Redoubt to Thiepval where we arrived at the new Visitor Centre for a break. Here we got into a conversation with two Australians, one of whom’s brother lived in Bolton! We put good money into the vending machine for something to eat and drink before Alan and I had a stroll up to see the impressive Thiepval Memorial to the Missing of the Somme. This massive structure has the names of over 73,000 British soldiers whose bodies were never found engraved on stone pillars. In contrast to an earlier visit, the place was full of British children on end of term school visits. We then continued to ride on through the Somme battlefields passing Mouquet Farm (known as Mucky Farm to the Tommies) to Pozieres, Contalmaison and Fricourt where we paused at another cemetery before dropping down for a café stop at Bray sur Somme. These roads are peaceful and quiet now in stark contrast to the situation in 1916. Then the last leg of the day’s ride through Rosieres en Santerre and onto Roye where on exiting the town Frank made an impromptu stop at a supermarket. Not knowing that this was the case and not having Frank in sight, Alan and I waited but then decided to continue onto to the hotel at Lassigny. Before arriving in the town we got a soaking from a field water sprayer which didn’t smell too good. On arrival in Lassigny we found the hotel, the Hotel Restaurant La Tete Noire, after a brief search just as Frank was riding in. Our helpful host directed us to a garage at the rear where we left out bikes and we made our way to our rooms. After a shower it was down to the bar for a well deserved beer. Our hostess served up a wonderful meal later on. A cloudy but warm day and a great start with a few climbs and long descents on the road to Compiegne which was marked in green on our Michelin map. Compiegne was easily negotiated and we passed the Town Hall where the Paris Roubaix cycle race starts every year. On leaving the town we were immediately into the Forest of Compiegne with mile after mile of tree-lined road ending just before Crepy en Valois. The roads then became more undulating as we went through Betz, Lizy sur Ourcq and into La Ferte su Jouarre. If time hadn’t been pressing we were going to stop here to view the Memorial to the British Expeditionary Force who lost their lives at the Battle of the Marne. In the event we continued and after turning on and off the main Paris road were confronted by a long straight climb to Jouarre and then it was on to Coulommiers where a café stop was made. Here we got the waitress to take our photo. After consulting the map we decided upon changing the route slightly to join smaller roads for the run in to Nangis. Frank mustn’t have grasped this as he disappeared from view before the summit of the climb out of Coulommiers. Alan and I waited at Chailly en Brie but continued safe in the knowledge that Frank, with all his experience, would make his own way to the hotel. We continued down a long straight road before turning right to Pecy, through Gastins and into Nangis. As we arrived we met Frank riding in from another direction. Unable to catch his attention he continued to a supermarket whilst we went straight to the Hotel de la Gare. Once again the bikes were garaged at the rear. In the room Alan and I shared there was shower gel, a shaving brush and cream and other luxuries including slippers. We made good use of these and came down for a beer. It was then that the management apologized and asked us to change rooms as a mistake had been made - our room belonged to someone else! The obviously disgruntled occupant watched our every move as we repacked our gear. This put right, we then made our way to the hotel dining room. After our meal we took a stroll onto the train station platform and stood well back as a TGV train sped through. I had a restless night perhaps feeling the effects of the dodgy water from the Bethune hotel. Another hot day but thankfully we were all fit and ready to go in the morning. Thanks to the one way system we had a tour of Nangis town before eventually leaving and headed out towards Monterau Fault Yonne, Voulx and Cheroy where it was market day. We made a halt here to buy provisions at the stalls then continued on to Jouay and Ervauville. After St Hilaire les Andresis a short cut to bypass the town of Courtenay was signed as being ‘road closed’. We decided to try it anyway and eventually the empty country lane led to a brand new motorway under construction. Fortunately the main structure of a bridge over it had been completed albeit without tarmac. We got off our bikes and pushed them over the metal and concrete structure before joining our planned route again taking us through Chuelles where we had a lunch stop at a bar where we were able to purchase a cheese and ham baguette. Then onwards through Chateau Renard and after Chatillon Coligny we joined a very minor road which took us through a forest and farmland. We got a welcome soaking from a field water sprayer at one point. Having passed through Ouzouer sur Treze it was a mainly downhill run into Briare situated by the side of the River Loire. Our hotel, the Hotel Le Cerf, was easily found but the manager was a bit dour. No meals were served at the hotel (except breakfast) so we ate al fresco down the road in the town close to the charming Briare Canal which flowed into the Loire. Frank enjoyed his first Spaghetti Carbonara of the tour here. Today we had to decide whether to navigate our way through Bourges or take a route around it. After consulting the map we felt that on a long mileage day we didn’t want to add any more than necessary so we decided on going through the city. We set off from Briare crossing the river Loire and canal to Chatillon sur Loire and continued through Sury es Bois, Vailly sur Sauldre, Villegenon, Le Chapelotte to Henrichment. We then headed towards Bourges through Menetou Salon before joining a dual carriageway into Bourges. A cycle lane was provided so this wasn’t a problem. As it turned out Bourges was easy to get through following signs for Montlucon and soon we were out and on the D road to Trouy. We stopped in a bus shelter for some shade and a bite to eat. We had covered 50 miles and we knew we had another 40 to go into a strengthening headwind. The countryside was now open rolling farm country with endless expanses of wheat on either side of us. At Chateauneuf sur Cher we stood our bikes in the shade and called into a bar for a lemonade and to top up our water bottles. The Tour de France was on the TV so we watched for a while. Continuing on to Lignieres we saw diversion signs that indicated our road to La Chatre was closed at Thevet St Julien. True to form we ignored this and continued on. Once at Thevet there had obviously been roadworks going on but the road was well and truly open. The last miles into La Chatre were difficult with the heat and headwind. However we were rewarded with a good hotel with a friendly manager who informed us the Mark Cavendish (Cav-en-deesh) had just won his fourth stage of the TdF. The bikes were garaged across the road in the hotel’s own bike garage. We had a marvelous meal at this hotel, the Hotel Le Lion d’Argent, which is highly recommended. An English lady who we later heard speaking fluent French asked us about our tour. It turned out she was in La Chatre for a Chopin Festival. With the heat intensifying Frank and I decided on taking the direct route to Gueret whilst Alan diverted off on the slightly longer planned route via Auguirande and Bonnat . Our main road (with hardly any traffic) was undulating but very pleasant and on arrival in Gueret we had a long climb in the hot sun to the town centre where we stopped in the market square for something to eat and drink. The market alas was just closing so we had to make do with what we had in our panniers. We sat on a wall in the shade watching restaurant clientele go about their business. On leaving Gueret we met up with Alan and continued on together branching off to La Chappelle Taillefert as planned. This was the ‘route touristique’ to Bourganeuf and was indeed very pleasant but very hilly. Towards the end we stopped at one summit for a photo at a massive Monument to the French Resistance at Combeauvert. This commemorates 31 soldiers of the Maquis executed by the Nazis on this spot on 9th June 1944. We continued until joining the main road for the last mile or so into Bourganeuf. On arrival we asked directions to our hotel, the Auberge de L’atre, and were sent the wrong way. However we eventually found it and immediately ordered some beers before garaging our bikes. Our hostess was very friendly and welcoming - and her boxer dog was too. Prior to leaving we called in the boulangerie for bread, pain au chocolates and a tartelette or two for our lunch. Another hilly but very scenic day was in prospect. We rode together until Eymoutiers where Alan left us for a diversion into hillier terrain. Frank and I continued up a long climb of our own on a beautiful winding road. The road then branched right towards Treignac and we were rewarded with a 9 miles descent passing a sandy beach at one point. This inland ‘resort’ was at the edge of Lac des Bariousses. It later transpired that Alan had taken this road too. He in fact branched off at Treignac for his climb of the Col des Geants and we met him later as planned at Chamboulive. We rode passed Seilhac then made a stop for a drink at a grand looking roadside hotel at Montargis. The place was empty (or seemed empty). On summoning the owner he served us lemonades and gladly showed us into the plush lounge and switched the TV on for us to watch the Tour whilst we drank. He and his wife joined us after we ordered a second drink Refreshed we pressed on to Naves and here began the long fast descent into Tulle. Half way down the group braked quickly as I shouted out that I had spotted the Tulle town sign with all the twin towns listed on it – including Bury of course. We pulled over for photographs. We were a little early for our rendezvous with our hosts outside the town so we waited a while before continuing. Our meeting point was the Intermarche supermarket about 2 km before the town centre. Soon after we arrived here Alan Shillaker and Jean Louis Soulier arrived by car and greeted us. Others soon arrived including Daniel Danovaro. We followed their cars down the long descent into Tulle town centre for our official finish outside the town hall. Photos were duly taken before our bikes were loaded into the back of a the larger car and we were all transported back up to the Intermarche where a right turn took us up to our hotel – the Manoir XV Domain de Peyrafort run by British (Welsh) hosts Ian and Frances Black. Left alone, and after checking in and having a shower, we had a few beers outside taking in the impressive view from the garden’s elevated position then had a meal with Alan Shillaker. We shared the large dining table with a Dutch couple and their two children. After our meal with glasses of organic red wine there was much conviviality from our hosts Ian and Frances. Alan Shillaker later walked back down to his hotel in the centre of Tulle whilst we only had to climb a flight of stairs. Today we left the bikes locked in the garage. After breakfast our hosts came up to the hotel to drive us down to the town hall for our official reception. Once there we were greeted by town officials and Cercle Laique de Tulle cycling club members in the grand inner sanctum of the town hall. 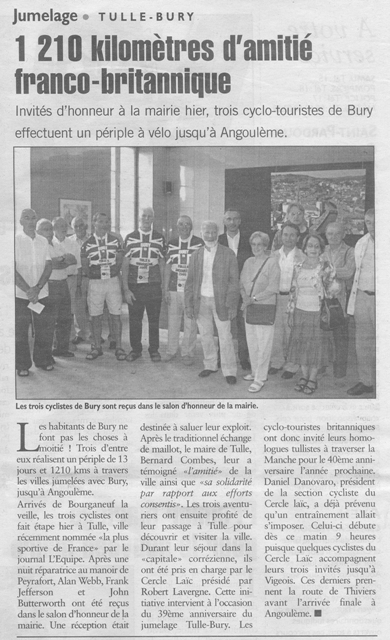 After introductions, press photos, speeches and a jersey exchange Alan Shillaker issued an invitation for Tulle cyclists to ride to Bury in 2009 to join the celebrations of 40 years of twinning between Bury and Tulle. Formalities over we enjoyed a few nibbles and some glasses of the local drink – a mixture of cognac with pineau wine. On leaving the town hall we all got in the cars again and transferred back up to our hotel for a fantastic lunch which continued until 4pm. About twelve persons were present including town hall officials, cyclists and a gendarme in uniform who was a Cercle Laique member. Then it was back down to the town for a guided tour of the medieval quarter given by Kathleen Fourches who originally came from Rochdale but has lived in Tulle for many years. Then after a refreshing bar stop we were driven to the old arms factory and the part of town which was the site of the dreadful atrocity by the Nazis on 9th June 1944 when 99 citizens were hanged from lamp posts and balconies as a reprisal for resistance activities. A further 149 citizens were deported of which 101 were never seen again. Alan Shillaker, who is the author of a short but very authoritative book on the subject - ‘The Martyrs of Tulle’ - gave us a commentary whilst pointing out the various locations. We were then driven to the memorial site out of town on the Brive road which was where the bodies had been brought to and hastily buried after the event. After this we were transported back to the hotel and made arrangement to meet the Cercle Laique cyclists at 8.45am outside the town hall for an escorted ride out of Tulle. On our own again, the three of us dined with a group of French guests and had an entertaining evening which went on later than we anticipated. We bid farewell to hosts Ian and Frances at the hotel – their young son had his bike ready wanting to ride with us. After a photo we got on our bikes again and rode down the long descent, chilly at this time of the morning, to the town hall where we met the Cercle Laique cyclists at 8.45. A friendly member of the public saw our jerseys and gave us his newspaper which featured us in it. Daniel Danovaro gave each of us a Cercle Laique polo shirt before we departed on our ride. All roads out of Tulle are uphill but this was an enjoyable climb in good company. Once on flatter roads it didn’t seem too long at all before we were saying our farewells at Vigeois after 30km had been covered. After they left we halted at a bar in Vigeois for a lemonade before pressing on through Pompadour, famous for its Stud, the Pompadour National Anglo-Arab Stud, headquarters of the French National Stud and France’s principal production centre of Anglo-Arabian horses. The terrain got hillier including a long climb through the winding streets of Payzac and the day ended with another winding climb into Thiviers. Our hotel, the Hotel de France et de Russie, was easily located but we were disappointed with our room which was basically in the loft. Our hosts were British and the service reflected that (a stark contrast to our hosts at Domain de Peyrafort). Before dinner we had a walk up the main street to the supermarket to buy tomorrow’s provisions and a large bar of chocolate was shared out between us. Then a very welcome beer was consumed as we sat outside the hotel prior to our meal. The starter was soup but we were surprised that it was stone cold. Alan informed us that it was gazpacho soup which is indeed served cold. We had arranged to meet some Angouleme cyclists at Javerlhac at 11am so we made an early start. A very fast start was made into St John de Cole as a result of a tailwind at last. The roads became hillier with the ride in and out of Nontron particularly interesting with a long winding descent in and a similar long climb out. However we made our rendezvous in Javerlhac ahead of time and the Angouleme cyclists were early too and waiting for us. After greetings we set off together. Vast fields of sunflowers were on either side of us at one point. They led us off our planned route at Bouex taking us on quiet lanes on the back roads into Angouleme. On arrival in the town centre we had another long climb up to the hilltop location of the town hall where we had a large party of officials and cyclists waiting to greet us. Also waiting for us was my brother-in-law David who had cycled there from his family holiday location in the region. After press photos and handshakes we wheeled our bikes into the town hall to park them and then we climbed the wide staircase to the grand hall where we had speeches and we presented a tour jersey which was promptly donned by one of the French cyclists. 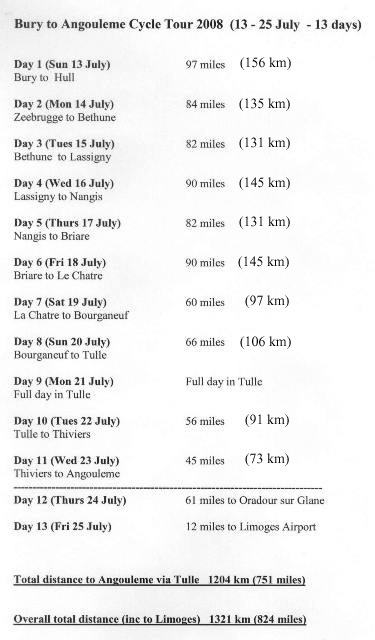 Alan Shillaker issued an invitation for Angouleme cyclists to ride to Bury in 2009 to join the celebrations of 50 years of twinning between Bury and Angouleme. After photos, nibbles, cognac with pineau wine and some socializing we went down to our bikes and rode over with the other cyclists, including David, to our lunch venue, the Maison des Jumelages. Marie-Jeanne Lavigne, the lady responsible for Angouleme - Bury twinning, had prepared a magnificent buffet which all the cyclists eagerly tucked into. We also enjoyed some beers which had been left behind by recent visitors from Angouleme’s German twin town. After this we walked our bikes down to our hotel, the Hotel Le Palma, and arranged to meet Marie-Jeanne at 6pm for a town tour. Alan Shillaker joined us for the tour of the older part of the hilltop town with its fine views of the surrounding countryside including the river Charente flowing below. We later stopped at a bar prior to returning to our hotel for the evening meal. We were joined by three of the cyclists who had accompanied us in and Marie-Jeanne. A superb meal and good company made for a very enjoyable evening. We were each presented with a Club Cyclotourisme d’Angouleme (C T Angoumoisins) polo shirt. We made arrangements to meet the cyclists at 8.30am for an escorted ride out of Angouleme. We set off at 8.30 led by three Angouleme cyclists, one of whom was Jacques Piffre, 77 years old and considered the doyen of clubs cyclotourisme angoumoisins (CTA). Without the worry of having to navigate we were soon out of the town and we stopped for a photo at the Angouleme town sign (as we had missed the opportunity on the way in). We were led as far at Montbron which was 30km out. Having said our farewells and shaken hands we were on our own again into St Mathieu where we made a boulangerie stop. We had stopped in some shade close to a bar. The owner was not happy when we attempted to put our rubbish in his bin, so a short walk back to the boulangerie sorted that little problem out. Then Alan made another solo departure to take in the back roads via Oradour sur Vayre whilst Frank and I continued on the planned route through Rocheouart and St Junien which had plenty of long climbs and long fast descents. Raindrops were felt as we climbed through Rocheouart even though the temperature was high. It didn’t last. On leaving St Junien we halted at a Lidl supermarket for drinks. Here an English couple now living in France spotted our jerseys and made enquiries. This resulted in them donating five euros to our cause. Refreshed, we carried on following the signs to Oradour sur Glane. This led us onto a short spell of dual carriageway – the main Limoges road - until we reached a roundabout where we had to make a left turn. At this point workmen shouted across to us indicating that we shouldn’t be riding our bikes here. Not understanding what all the fuss was about as the dual carriageway had very little traffic on it, we ignored them and exited the roundabout onto a very quite country lane which led all the way in to Oradour sur Glane. On our arrival Alan was already there waiting for us and we checked into our hotel, the Hotel de la Glane. After showering we had a short tour of some of the cafes and bars and enjoyed a few beers. We ate in the hotel restaurant. An English group on the adjacent table advised us not to order a dish which translated as gizzards. We need not have worried as the very efficient waitress provided us with a very enjoyable meal. As our flight wasn’t until 3.30pm we had arranged to meet Alan Shillaker at the airport at 1pm. This gave Alan and I time to walk down to visit the martyred village. The old Oradour sur Glane was burnt by the Nazis and the entire population murdered on 10th June 1944. The ruined village has been preserved as a memorial to this atrocity. Rusting contents of the buildings and cars remain in position as they were on that terrible day. The old village is now entered through a new Visitor Centre but there is no charge made if just visiting the village. The visit completed we met Frank back at the hotel at 11am and checked out. We set off making a café stop for a lemonade after only 5 miles at Veyrac. We then rode on to the airport arriving just as Alan Shillaker was arriving by taxi from Limoges. He unpacked the polythene bike bags which he had kindly hauled around France in his suitcase and we removed our pedals and turned the handlebars prior to packing the bikes. We had some difficulty in removing Alan’s pedals – it was only Frank’s full body weight pressing down on the spanner that shifted them. We checked in, boarded our flight and landed at Liverpool in good time. On the way to passport control we called Frank’s wife Deb who was picking us up. Thankfully our bikes were largely unscathed. We unpacked them, straightened the handlebars and loaded the panniers and wheeled our bikes out to the car park to await Deb. She duly arrived and Frank strapped the bikes to his boot bike rack and with Frank at the wheel we started the last leg of our journey back to Bury. The tour was completed without any mechanical problems or punctures. At one point on a winding descent Frank ran off the tarmac into the rough stuff at the side of the road but managed to safely get back onto the road without a spill. A brief stop was made later to repair some slight damage to the rim and tyre wall which resulted from this incident. Our average speed rounded off at 12 mph (19.3 kph). Not bad considering the hilly terrain later in the tour, and the loaded panniers. 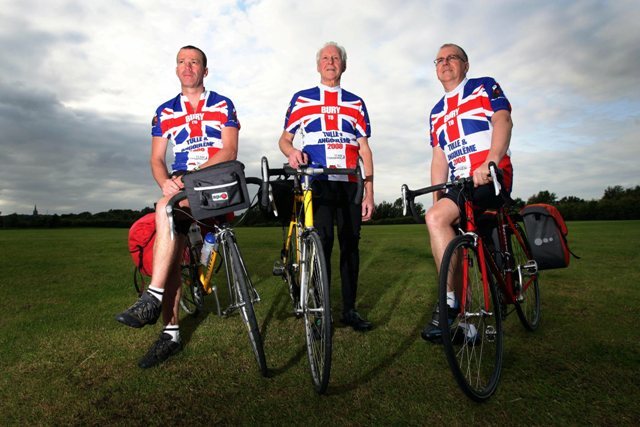 The riders are pictured above from left to right – Alan Webb, Frank Jefferson and John Butterworth. To highlight our connection with BMCTA we rode as TEAM TWINNING. We have raised a total of £891.41 for Derian House Children’s Hospice thanks to your individual sponsorship. Tulle’s main industry of the manufacture of firearms recently went into decline. At one time Tulle was famous for its lace – Le Poinct de Tulle. After the French revolution this industry disappeared but the tradition is maintained by a voluntary organisation. Tulle claims to be the capital of the accordion. The cathedral – an abbey before 1317 - is situated at the east end of the town. There are two markets at each end of the town. One stretches along the river bank behind the Cathedral. The other is in the Place Smolensk next to the railway station. They both take place on Wednesday and Saturday mornings. There are four museums. The Cloister Museum, next to the cathedral, the Museum of Resistance and Deportation, an accordion museum at the Maugin accordion factory, and, at the west end of the town, the Armaments Museum. Between La Rue Jean Jaurès and La Rue de la Barrière, is Le Passage Bury. It has a red British telephone kiosk and a red British letter box – both donated by Bury, and a children’s play area. In addition to Bury, Tulle is twinned with Lousada (Portugal), Renteria (Spain), Schorndorf (Germany), and Smolensk (Russia). 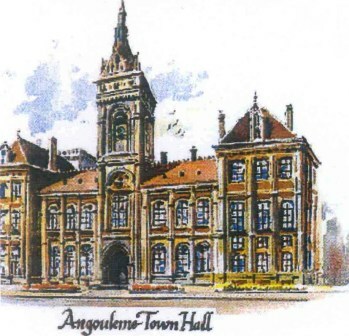 Angoulême has been twinned with Bury since 1959. The original link was made because of their common industries – felt and paper making – although these are no longer important in Bury. Angoulême has also diversified its industries. Situated on the River Charente and in the Charente Department, it is north east of Bordeaux and east of Cognac, where distinctive wines, spirits and a fortified wine ‘Pineau’ is blended. It has a population of about 120,000 and is an important administrative centre. Angoulême is an old, recently restored, walled city with a magnificent mediaeval town hall – built originally as a castle for Marguerite de Valois, sister of Francis 1 – and a beautiful Romanesque cathedral, dedicated to St Pierre. One of the town centre roads has been named ‘Boulevard de Bury’ (just as Bury has Angoulême Way) with an English red telephone kiosk. In addition to Bury, Angoulême is twinned with towns in Canada, Germany, Mali, Russia, Spain, USA and Rumania.